Visiting York and want to relive a unique piece of history? Welcome to these two stunning luxury apartments situated in the shadow of the glorious York Minster, in the very heart of York, tucked away behind The House of Trembling Madness, Stonegate. Both of these stunning apartments are to be found in a hidden courtyard containing the remains of the first Norman House to be built in York, c1180AD. If that's not enough history for you, the detached building is over 650 years old. The Chamber is a timber framed medieval structure, and while its history is unknown, evidence of hauntings have been reported from previous residents. If you'd rather swap bumps in the night for lava lamps & retro chic, you might prefer our Old Gallery! Both apartments are across two floors, and packed with entertainment facilities, all the creature comforts, quality linen & snuggle down duvets, towels & bathrobes. Unfortunately we cannot accommodate any pets. But these apartments are perfect for all the family to enjoy this picturesque city while living in a unique time-locked snippet of history! 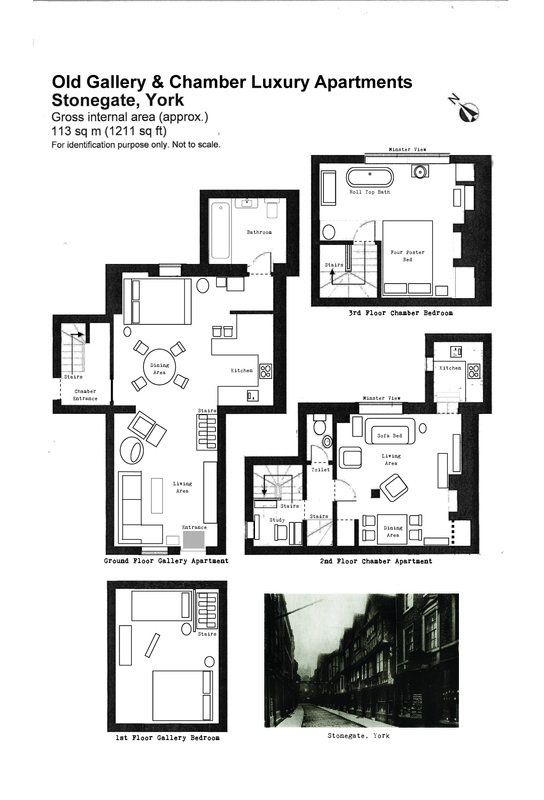 description: the old stonegate gallery is a ground floor studio flat with a loft sleeping section (steep stairs). a full modern bright feel with a 60/70's retro kitsch twist. the most central point in York centre but silent and hidden. description: the madness chamber is haunted and is well over 600 years old. its a time capsule for york containing wood panelling and overlooking the minster. silent with an small outside yard, the perfect retreat. "Read the Telegraph review April 2017 here"